Paul Thiene (1880-1971) had been a partner in a Portland landscape, florist and nursery business established in 1906. 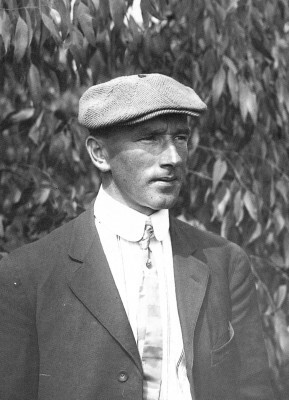 By 1910 he was in San Diego, where he purchased ten acres of land in Old Town and established the Ramona Nursery. When the Olmsted brothers resigned from the Panama-California Exposition on September 3, 1911, in protest over a decision to locate the exposition on Balboa Park’s central mesa, rather than less intrusively on the park’s southern boundary, near downtown San Diego, Thiene saw a chance for advancement and leapt at it. Four days after the well-publicized resignation, he wrote a respectful letter to Frank P. Allen, Jr., the Exposition’s Director of Works, requesting a promotion in the event that the nursery supervisor, William Donald, pulled out with the Olmsteds. When Donald left, Thiene was elevated to Exposition Nursery Supervisor. Overseeing a nursery with hundreds of thousands of plants under cultivation was a big job, but within a few months, Thine undertook even broader responsibilities. He was again promoted, this time to Supervisor of Landscape for the exposition. At the exposition, Thiene met the woman with whom he would share the remaining 60 years of his life. Paul Thiene died in 1971, famous for his landscape work on estate homes, but without appropriate acclaim for his contributions to San Diego horticulture and particularly the celebrated beauty of the Panama-California Exposition grounds. He also deserves more credit for “The Exhibition Flora,” an obscure but priceless plant list contributed to the Official Guide Book of the Panama-California Exposition 1915. It is the best extant listing of landscape plants found in San Diego as of 1915. Thiene arranged the entries by botanical name in four categories: Trees and Shrubs, Vines and Climbers, Herbaceous and Miscellaneous, and Wild Flowers (and other blooming plants) which are further categorized by color. Entries include popular names and a brief description of each plant. By devoting almost 25 pages to this listing in the official guidebook, officials proclaimed their pride in the horticultural achievements of the Panama-California Exposition and their confidence in the work of Paul Thiene.